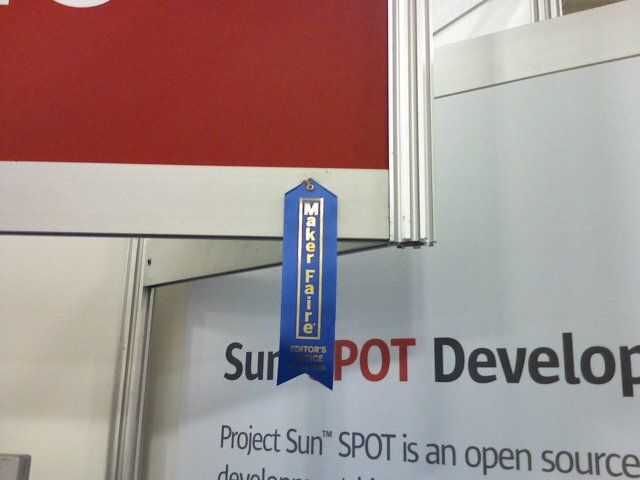 shown here in the Java One SunSpot pavilion. 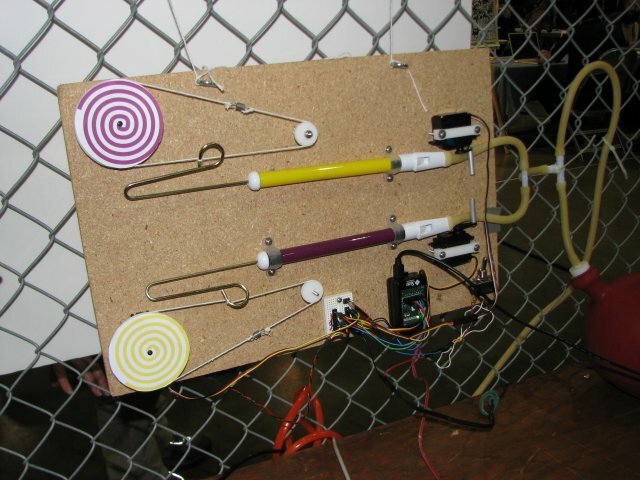 Here are some of the Maker Faire SunSpot contraptions I have built. This is A sun-spot powered "calliope" I was building during the Maker Faire. 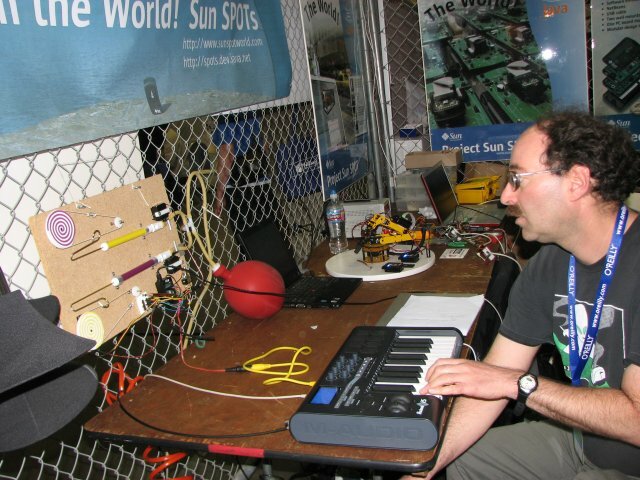 The sunspot has a "midi in" jack connected to a keyboard, and interprets the Midi commands and controls two slide whistles with four servos to play "music". Although the software supports multiple slide whistle calliopes - the MIDI data gets broadcast over the Spot Radio network - thankfully, I only built one. What you don't see is the industrial air compressor under the table providing the air supply. Here is the finished version. along with a short youtube video. Never underestimate the value of shiny black plastic in science fair projects. Roger (my boss) wrote a nifty application for SunSpots called "air-text". You wag a sunspot back and forth, and it displays "words" in the air using the 8 on-board LED's. Dave was "air texting" a lot, and his arm was getting tired ( short air-text video ) so he bought an industrial sawz-all to automate the wagging aspect. After nearly being decapitated by a Sunspot being hurled across the room by an angry sawz-all, I decided to make my own version, using a "hand saw" instead. Well, you kind of have to be there, or take a look at the youtube video. 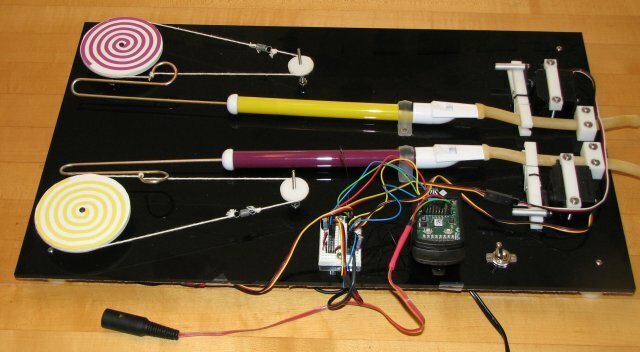 The Accelerometer built in to the Spot controls a servo attached to the saw, swinging a counter-weighted arm back and forth in a manner analogous to pushing a child on a swing. It was early on in Spotsville, and Late one Friday, Dave, Roger and I were trying to come up with a compelling demo for an education conference Roger was attending that Monday. I thought real time language translation would be a cool demo, but the "other guys" were worried it would take too long to implement, and we wouldn't be able to finish it in time for Roger's flight. We ended up with the "semaphore Bot". 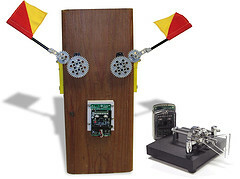 You enter Morse code with a keyer connected to one spot, which transmits it over the Spot Radio to the Semaphore Bot, which proceeds to translate the Morse code into semaphore. This is especially useful in an educational setting considering how few people know Morse code these days. 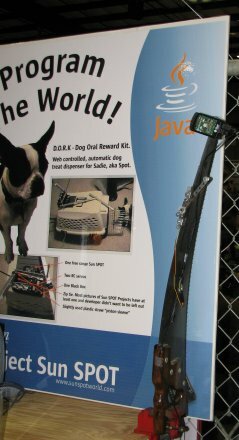 Before the now famous "eSpot", our current production version, we had a prototype version called the "bSpot". Unlike the "eSpot" demo board, with a programmable controller on board, it was fixed-function only. Having spent plenty of time with "basic stamp" computers, wishing they had a "real" programming language, I really wanted "basic stamp" like capabilities "out of the box" on the new Spots. So I took an Atmel Tiny/13, taped it onto the Bspot, and made a robot out of it. I like to think it made a compelling enough demo to sway the argument in favor of a programmable demo board (of course I got to write all the code for it). 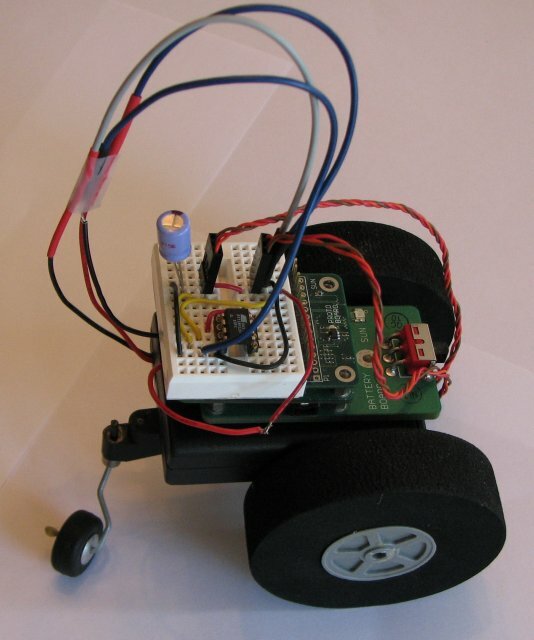 Here is a canonical Spot Robot sitting under and controlled by an E-spot (short video). After using SunSpots for a while, you end up using them in lots of stuff, simply because they make it easier to do. So when we got tired of crawling under the table to plug and unplug our various demos, it was a no-brainer to build a spot controlled outlet strip. 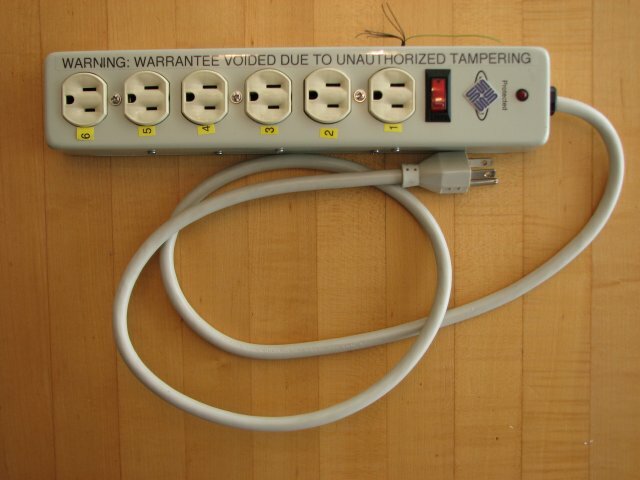 The strip has been slightly modified, a solid state relay wired to each outlet is controlled by an I/O pin of the locally connected Sunspot, which received on/off commands over the radio from a remote Spot. The Spot has since wandered off in search of something more exciting to do.